New year brings with it new designer collections. Anita Dongre just launched her spring-summer 2019 lehengas yesterday. I have every single one of them here for you to see. Anita Dongre Lehengas are known for their gota-patti intricate work. This time around, the new thing is hand painted summer lehengas. 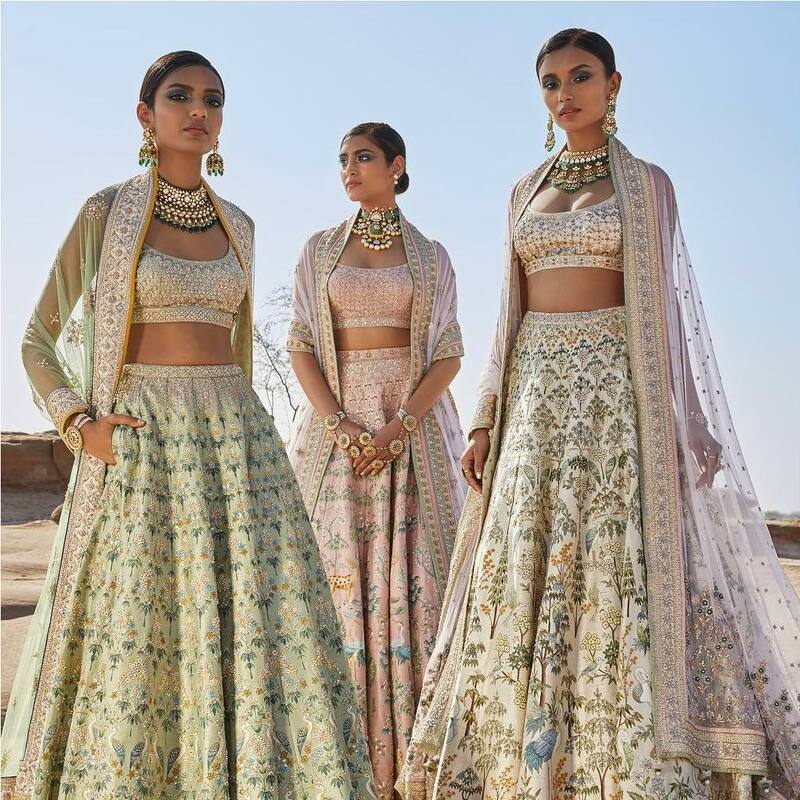 2019 spring summer Anita Dongre Lehengas titled Pichhwai Collection is a limited edition. It consists of 15 unique lehengas all hand painted by Lekhraj Ji. Where Can You Shop Pichhwai Anita Dongre Lehengas? When the deer and the herons come together to dance amongst the trees. You get a beautiful poem in the form of Pichhwai art. A classic lehenga with intricately embroidered florals, embellished with pearls, sequins, zari and zardosi, all wrapped in delicate blush silk organza! The quintessential lehenga with intricately embroidered florals, embellished with pearls, sequins, zari, zardosi and our signature craft gota patti, all wrapped in a delicate peach drape. Cost of 2019 Anita Dongre Lehengas? Inspired by the stoic herons that fly across the wetlands of Rajasthan, this aqua blue lehenga is painstakingly hand painted in traditional Pichhwai style. Unfortunately, I don’t think the Pichhwai Collection lehengas will be up on Anita Dongre Website anytime soon. Since it is a limited edition collection, I guess one has to contact the designer’s team for exact prices. Going by the efforts it has taken to make these, you should assume these gorgeous summer lehengas don’t come cheap. In my opinion, you should keep a healthy budget of at least 2.5 Lakh plus to own one of these. Although I must warn you, some of the more exquisite pieces may go upwards INR 6 Lakhs a lehenga ! If you want a general idea of what Anita Dongre Lehengas cost, I have some posts that might help you. These include previous years Anita Dongre summer collection lehenga prices as well. What Is Pichhwai Collection All About? An art as old as time, the traditional Rajasthani art of Pichhwai inspired this special edition wedding couture capsule. The art of Pichhwai is renowned for presenting nature in all its glorious detail. An element that is revisited in all our collections. Intricately painted by hand, each Pichhwai lehenga mirrors the countless effort, minute detailing and intricate handwork of the artist. Pichhwai is a craft that dates back to the 16th century. We have created this collection to sustain the craft and empower the artisan. This is a gorgeous lehenga to wear to your mehendi. The colour screams mehendi function appropriate. Of course, it’s an expensive mehendi outfit. So you may want to be careful about not ruining the dress with mehendi stains. Two years ago, during my visit to Rajasthan for a shoot. I had a chance encounter with Lekhraj Ji, while he was painting the walls of City Palace. Intrigued and inspired by the intricacy of his work and his flawless brush strokes. I immediately knew I wanted to give this art another form of life. We chatted about his art. He shared stories of his work being inconsistent. Today, sustaining our traditional art and craft forms fuels my creativity. We invited Lekh Raj Ji over to our Design Headquarters in Mumbai. That’s how the Pichhwai Collection came to life. Comprising 15 limited edition pieces, exquisitely hand painted by our master craftsman. Every ensemble from our Pichhwai collection is full of minute details and intricacies. Have a closer look at each outfit and you will see the countless effort in the design. Envisioned by us and brought to life by him. In hues of blue, yellow and white, tiny spring flowers camouflage the beautiful birds as seen in the forests of Rajasthan. These nature inspired lehengas have an entire forest hand painted in them. Anita Dongre lehengas although look decent pretty in pictures, let me tell you, in person they look spectacular. I remember seeing some of their more opulent bridal pieces at Vogue Wedding Show 2018, and it was one of the most striking stalls in the hallway. The colours of her lehengas, the richness of the work, you really can tell why they demand the price they do. Over the horizon of an azure abyss, the graceful herons spread their wings and fly across the disappearing wetlands of Rajasthan. Inspired by these stoic herons is our Awa gown, meticulously hand painted in traditional Pichhwai style. Reminiscent of the forests of Rajasthan, where the Chinkara prances around in pursuit of a whimsical wonderland, this fierce red lehenga is intricately hand painted with motifs of the dancing deer. This one is pretty similar to the other red bridal lehengas from Anita Dongre’s collection. The only difference being, the work and detailing on the lehenga is obviously different. This lehenga is inspired by the forests in Rajasthan. All of these lehengas are still in Anita Dongre’s signature style of gota patti, dori and zardosi sequins work. A similar looking Anita Dongre bridal lehenga costs anywhere between INR 2 Lakhs to INR 5 Lakhs. You can see the lehenga prices on Anita Dongre’s official website. Inspired by the stoic herons that fly across the wetlands of Rajasthan, this ink blue lehenga is painstakingly hand painted in traditional Pichhwai style. The epitome of opulence, the Kaiya Saree is embroidered to perfection in motifs of wild flowers and filigree onto exquisite chiffon. This blush saree is paired with a matching tulle embroidered choli. BONUS: Did you know Anita Dongre also does Bridal Jewellery?